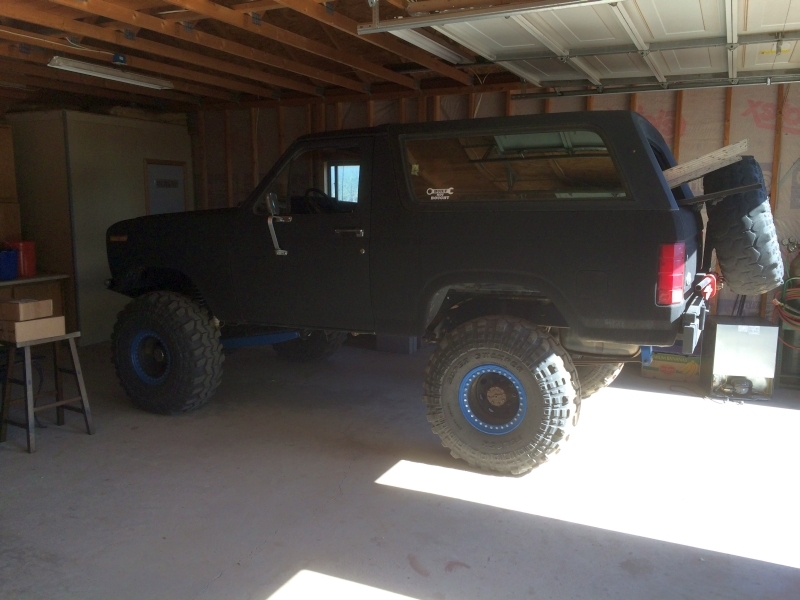 As I was looking around for pics in preparation of FOTY I found a couple of the Bronco checking out its new home. We moved into our current place in July of 2014 and the garage was just a shell. 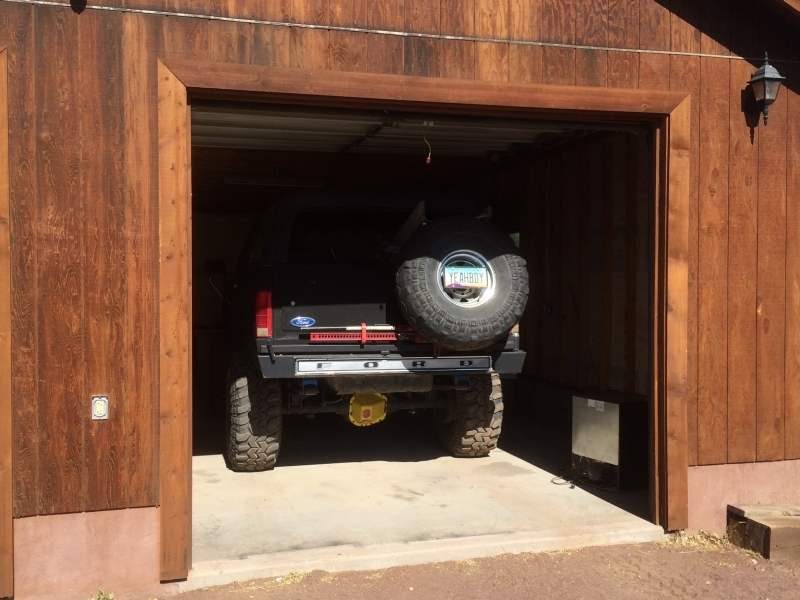 Although that is a different project, my garage is such a part of my Bronco’s story. I’m pretty proud to have what I do. The garage isn’t huge, a slightly oversized 2 car but I’m well aware that some guys are working in their driveway so I’m not complaining. The main group I wheel with is about 7 rigs and they all happen to live on the same street "Flanders St" so every time we go and invite a friend we say we are going out with the"Flanders". 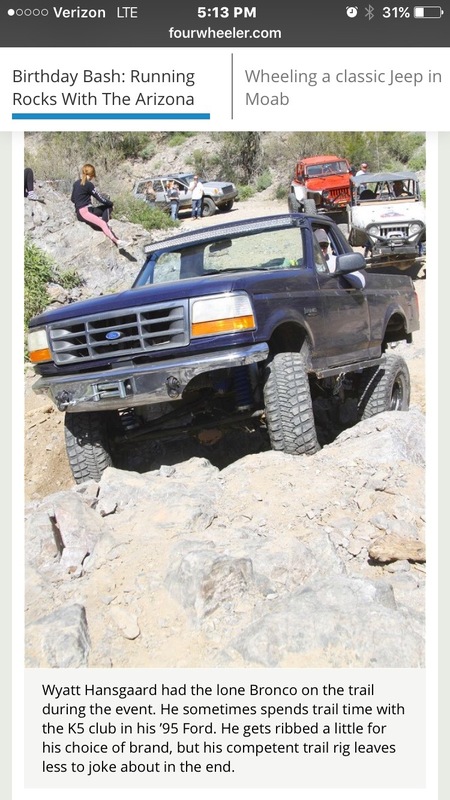 Always fun to get feedback after these trips are through because most all the "Flanders St" people have capable rigs. @itwasfree and @Quader1 has been on 1 or 2 trips with a couple of these guys and its never a dull time.. 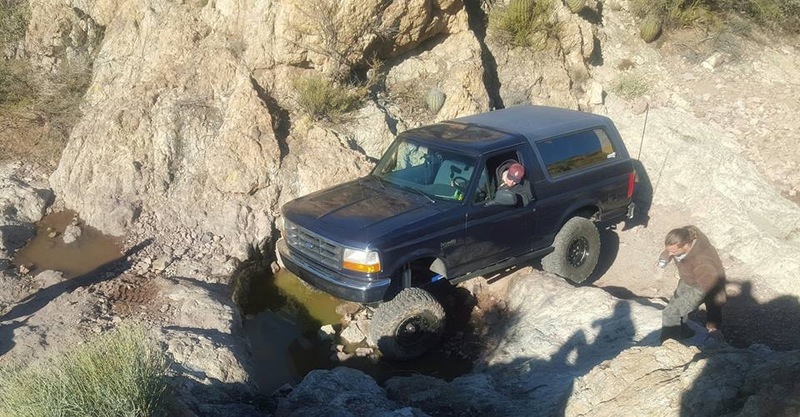 This is the first time out after going from stock to not so stock, the rig performed extremely well and I pushed it quite a lot to find out the weak spots that might need attention. 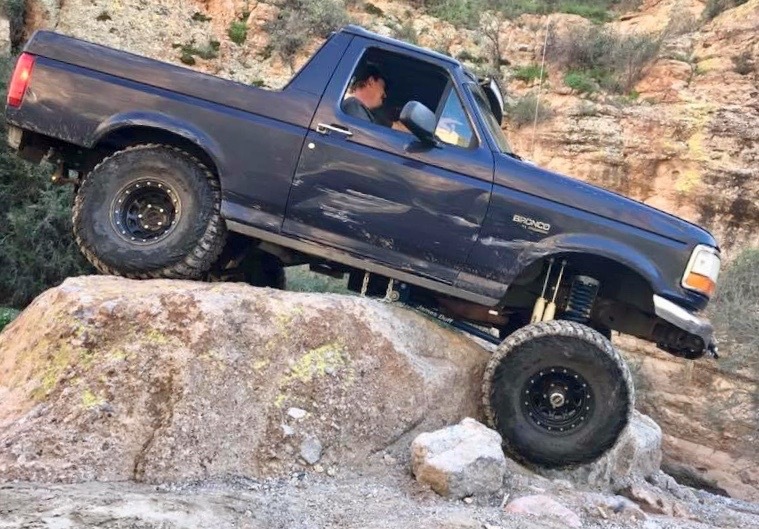 Nothing actually broke that day and I drove it about 100 miles to the trail and back, I knew that this thing was solid and limited mostly by size and weight. 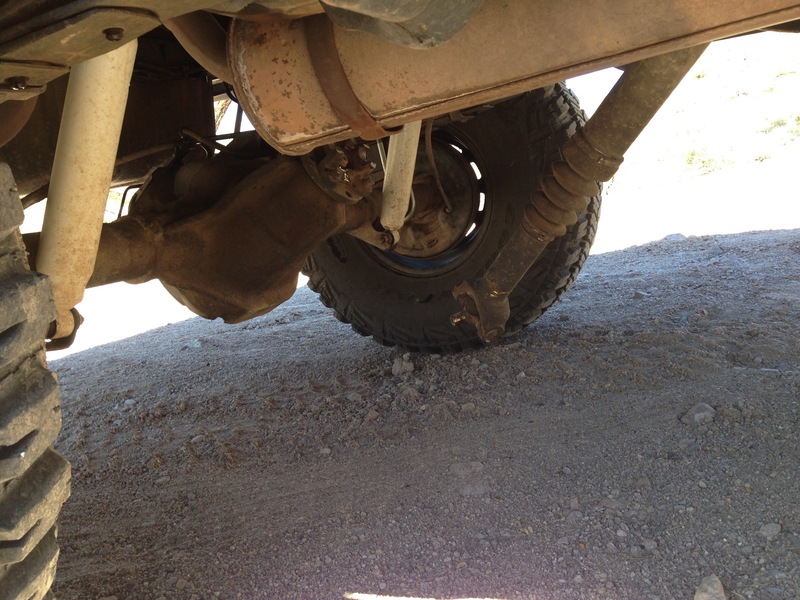 So, the better half and I did eventually get out of that trail and did drive home.. On the drive side front axle shaft at 30MPH, thank god for lockers my friends. BikerPepe`, itwasFREE!!! !, White Dragon and 8 others like this. Just trying to stoke the fire, its a good round of rigs for this competition and nice to see more of them, especially in action, like most of your posts. Keep them coming if your able and I can relate plenty about life taking priority over a hobby, its not easy juggling our time. Its not over yet, good luck to ya! 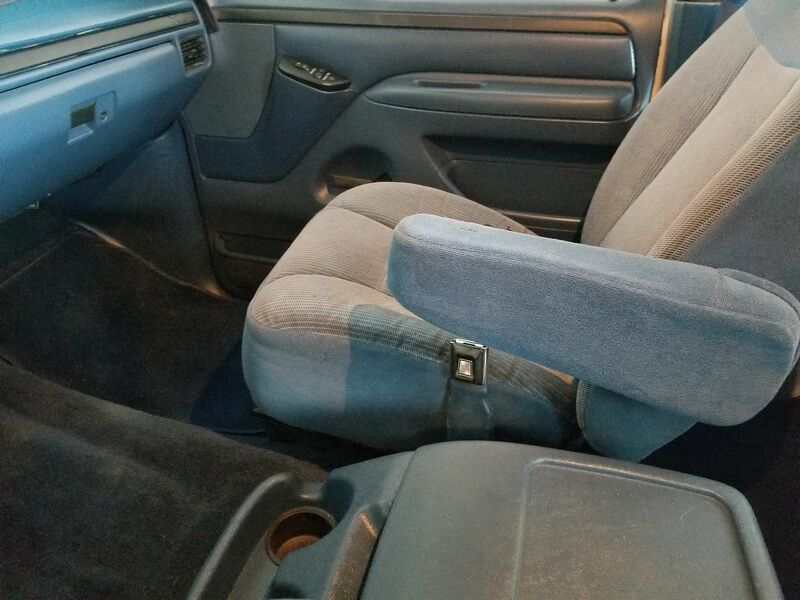 I mentioned earlier that I turned the back seat around & it faces backwards. So far, that's been a good thing, because the dog loves to have more room. 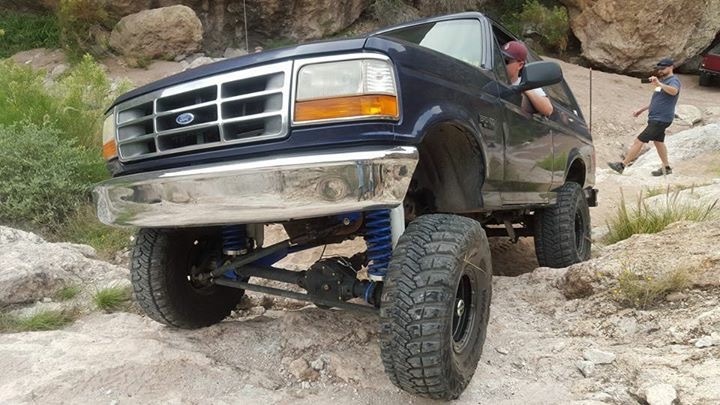 The bad thing about having a lift kit is that she's a little reluctant to jump that high. Ugh! 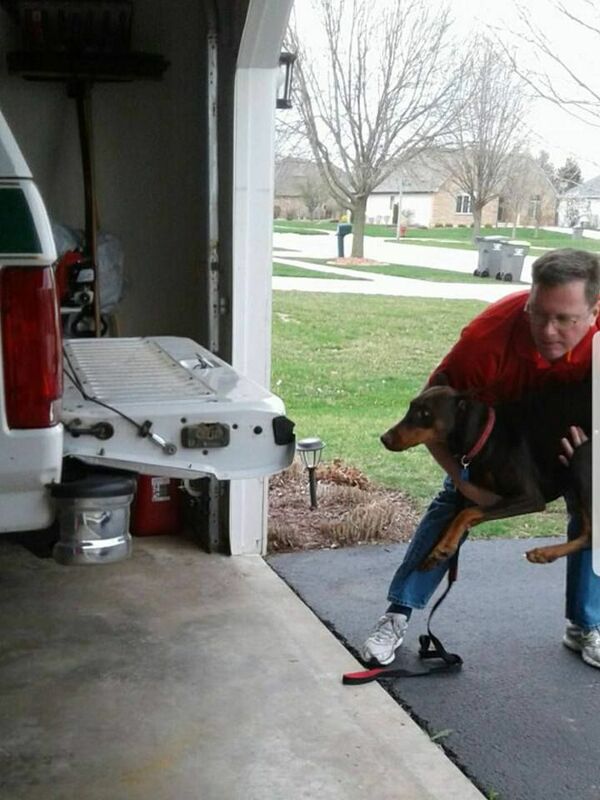 The things I do for that dog! And here's a photo from the wife, who was following us that day. You can imagine the looks we get going down the road. Sometimes when I look back at what I had, I can't believe it. And looks are just part of the story; it ran & drove about like it looked, which has also changed completely. 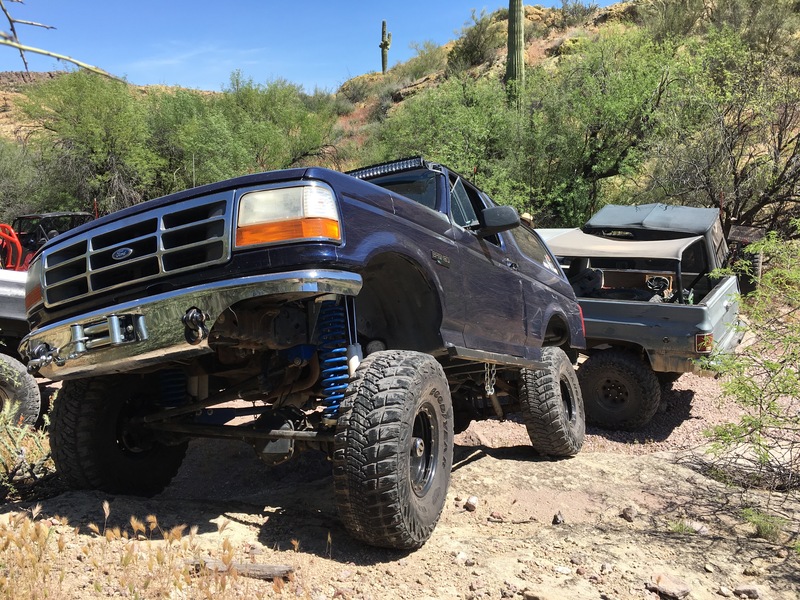 Like I said before, it would have been cheaper to start with a good clean low mileage truck and build a replica than to go the way that I did. But I'm incredibly glad that I found H6230 and was able to save it! Work on H6230 isn't done; there's quite a bit left to finish. Hopefully once I get one kid out of college, some of the planned big steps can be started on it. 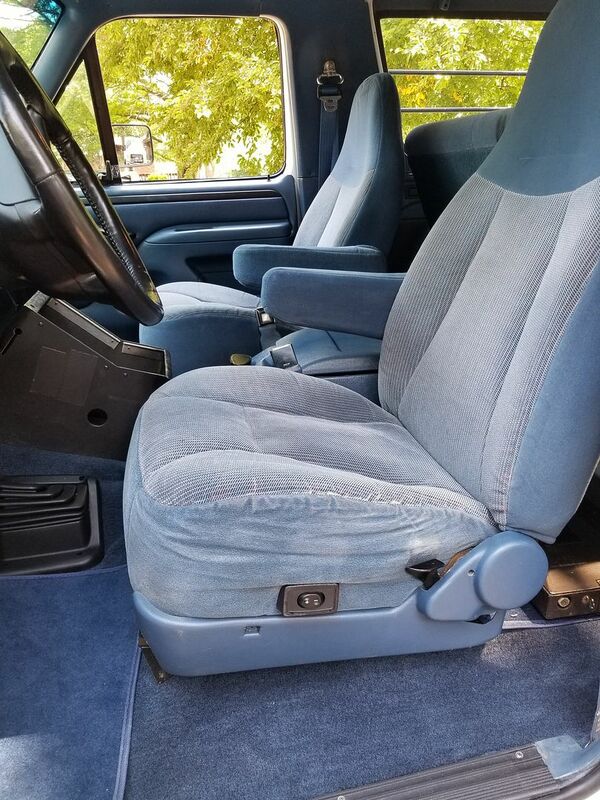 For now, I'm quite satisfied to have it in (more-or-less) the same kind of condition it was when I was driving it in the late 90's. It's hard to believe that was more than 20 years ago. cast my vote tied it up 13 to 13 we may go into overtime! There's still time to vote tho. itwasFREE!!! !, sackman9975, cstrike and 1 others like this. Wow, I didn't think I'd run out of pics but a month and a half has been a long run! I appreciate all the votes and the other rigs on here. Honestly it is nice to be in the running but I've had a good time regardless the outcome. I'm currently replacing a crappy bushing style track bar with a heim track bar from Ruff Stuff (love those guys!). I have a few pics I can share in the last few days. 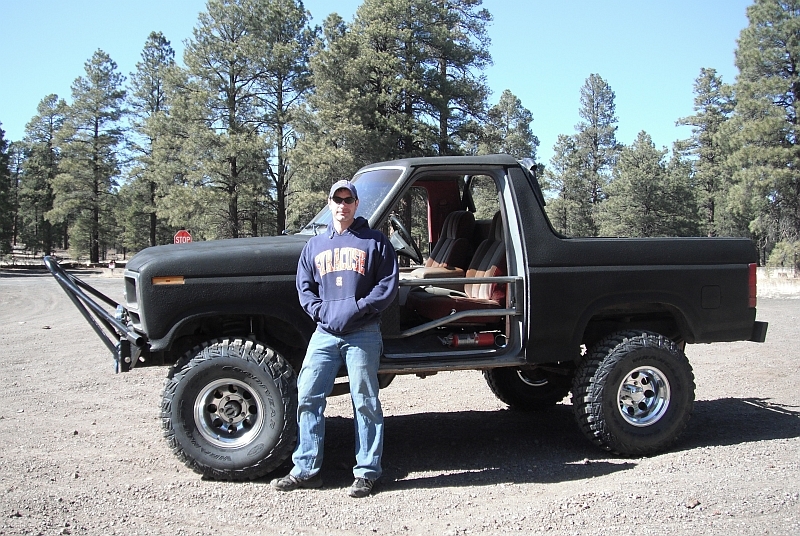 Just in case I can't get more content, I’ll end with an early pic of me all proud with my Bronco…..
And a ‘happy trails’ kind of shot…. Hey FSB I've got a few minutes here so Ill share some action pics from the last few years, no crazy stories to add on this post just pure fun! Apologies if you've already seen a couple of these, hours of labor translates into good times here! 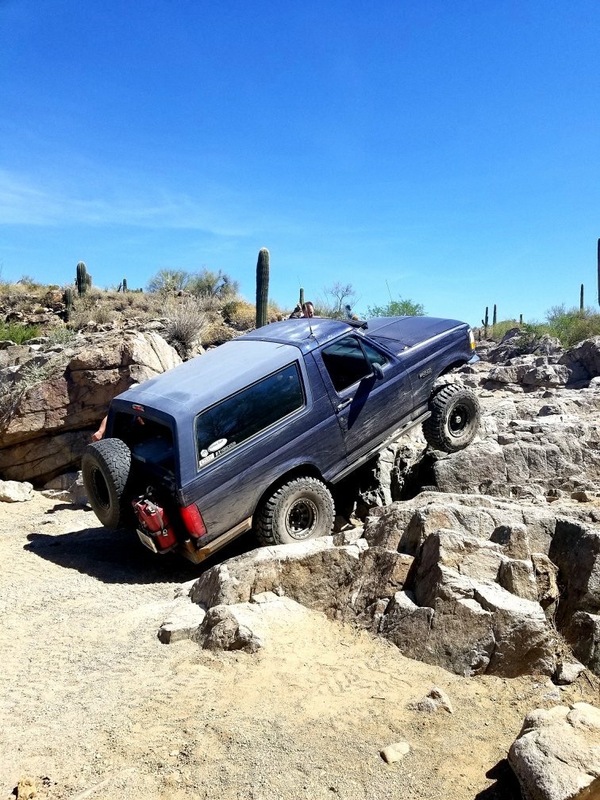 Moving forward I'm reaching out to friends who have footage of my rig since now I realize I don't take many photos or videos while Im out wheeling or in the garage turning wrenches, lesson learned.. This video is of an early trip to Sedona on one of the first dates with my now wife. I let her drive the entire time. Although none of the wheeling action is particularly impressive, the look on her face in some of the shots makes me happy. BikerPepe`, itwasFREE!!! !, sackman9975 and 6 others like this. 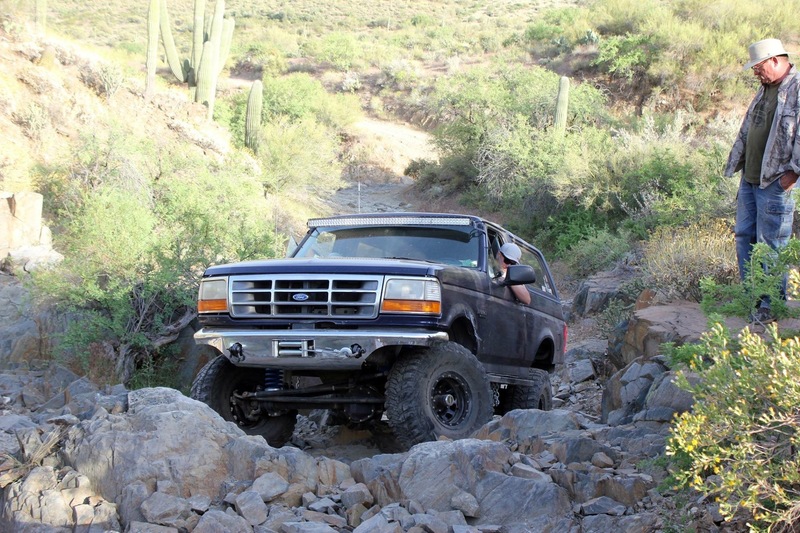 Here's another Bronco-involved story from way back when H6230 was new. I hope you guys are enjoying these flashbacks, and I hope I'm not swamping you with material that people really aren't interested in hearing. Maybe it breaks up my descriptions of replacing broken parts & photos of my truck in a corn field. About a month after arriving at my duty station, I responded to the first of several shootings I’ve worked in my career. I was still riding with a training officer and working the evening shift. 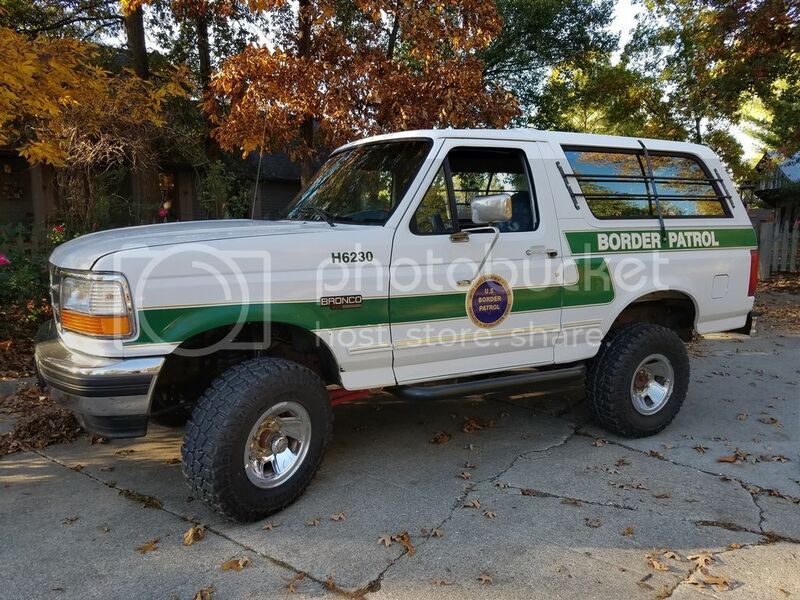 We were in a Bronco and crawling slowly through the canyons looking for footprints a few hundred yards north of the border when an urgent voice crackled on the radio, requesting immediate backup for shots fired. 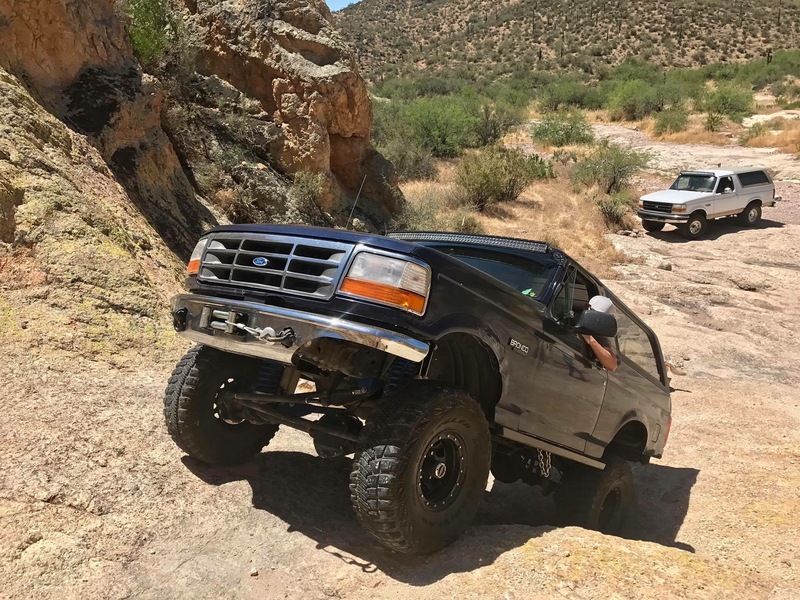 My training officer immediately spun the Bronco around and we flew down the bumpy trails, ripping through the brush and banging hard on the medium-to-large rocks that peppered the area. It was a hang-on-tight, balls-to-the-wall sprint for about a half mile to the location, and we skidded to a stop in a cloud of dust, just north of the border fence and up the hillside from an agent on foot who crouched approximately 10 yards away from a motionless body on the ground next to the fence. The agent, gun drawn & pointed at the top of the fence, was yelling in Spanish at unknown people on the other side. A few curious heads peeked over the metal barrier from several spots many yards away. I'm sure there were many more looking through the small gaps between the panels. We jumped out of the Bronco; the senior agent with the shotgun in his hands & me with my pistol. Spreading out slightly, we got to the best position possible to cover the agent near the fence and maintain some cover ourselves. The hillsides were illuminated with bouncing headlights as at least a half dozen other Broncos sprinted to the scene. Unable to understand much of the confusing chatter on the radio, I simply held my position, aimed in at the fence and scanned the area for threats popping up from the other side. Within seconds, the area was swamped with agents and the people on the south side were gone. The Border Patrol helicopter flew across the scene with his spotlight on, making wide circles around the area and crossing into Mexico (the only time I’ve ever seen them do that). Later, the whole story came out. An agent had been trying to catch a few guys who had been unsuccessfully trying to slip past him all night. Finally having enough, he chased them on foot to the fence, where they climbed over and back into Mexico. However, he grabbed the last one before he could climb across, and took him to the ground to handcuff him. 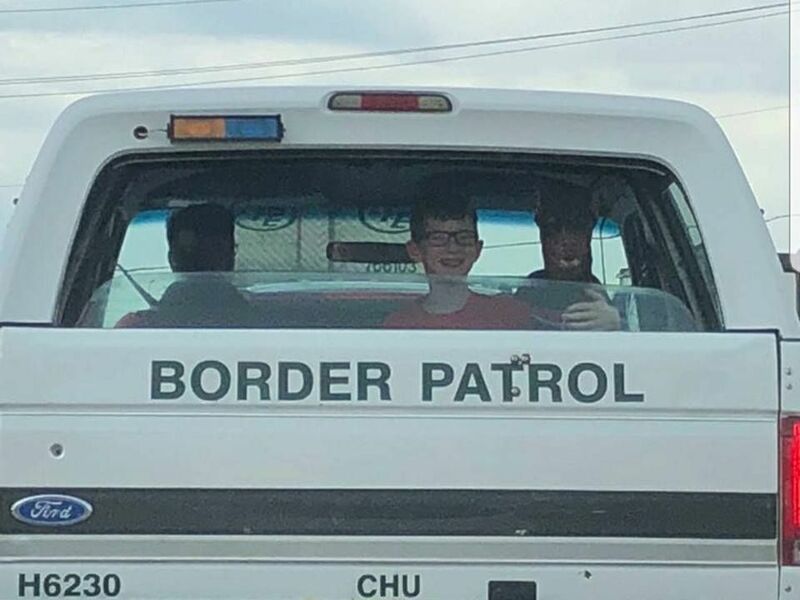 At this point, the guy's buddies thought to help him by grabbing rocks on the Mexican side, climbing back to the top of the fence, and throwing them down forcefully at the agent, who was still struggling to get the handcuffs on. Unable to retreat safely or protect himself from the assault, he pulled his pistol and shot one of the fellows who was straddling the fence. As the guy fell to the ground dead, the agent released the one he had been trying to handcuff and created some distance from the fence. That was when he called out on the radio for backup. The shooting was determined to be justified, and rightly so. When someone attacks you with fist-sized rocks, it’s a deadly force situation, and you have every right to protect yourself and those around you. Although I wasn’t driving H6230 that night, it was there and responded to the same incident. 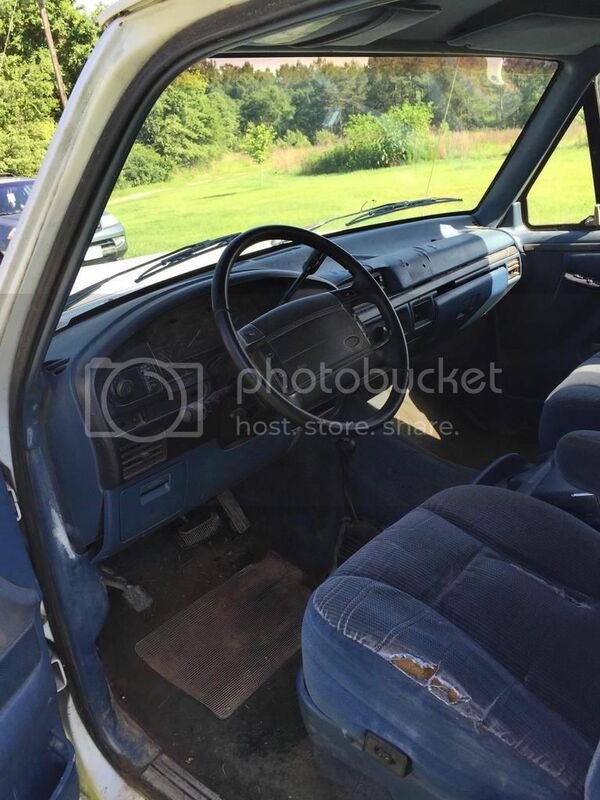 It’s just one of the many memories I have of those days that I can vividly recall when I sit in that blue interior or look out across that hood. This was also one of the reasons I started checking out a shotgun or rifle almost every night. Better to have it & not need it than the other way around. 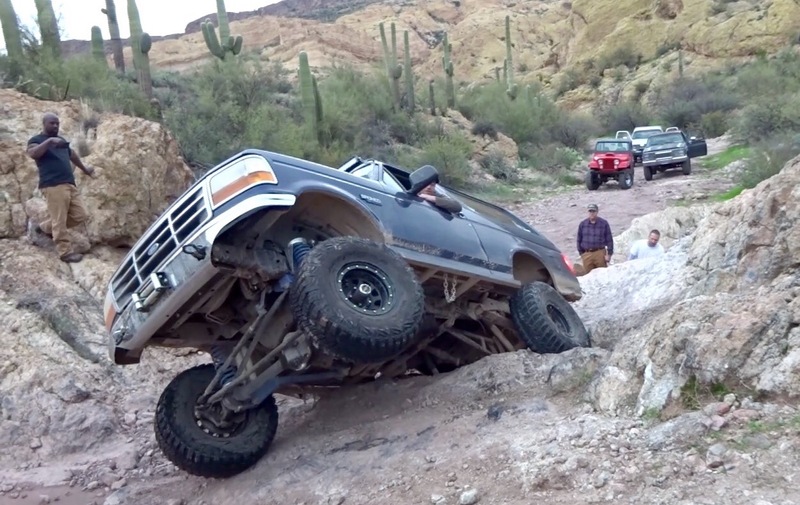 Here is a video of the day at Table Mesa with the guys. It is a bit embarrassing because you can hear the mechanical fan hitting the fan shroud, I had just moved it. 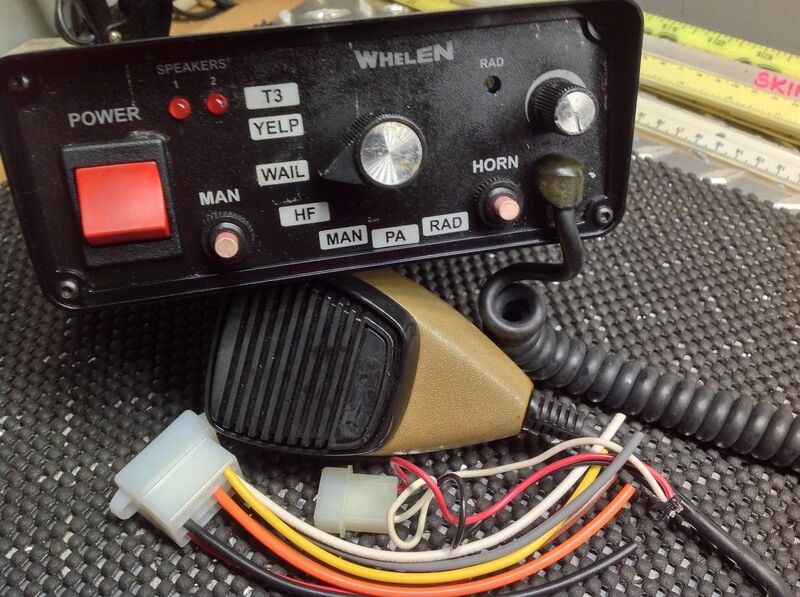 So let's talk a little about another little project that's going on with my Bronco build: the center console. 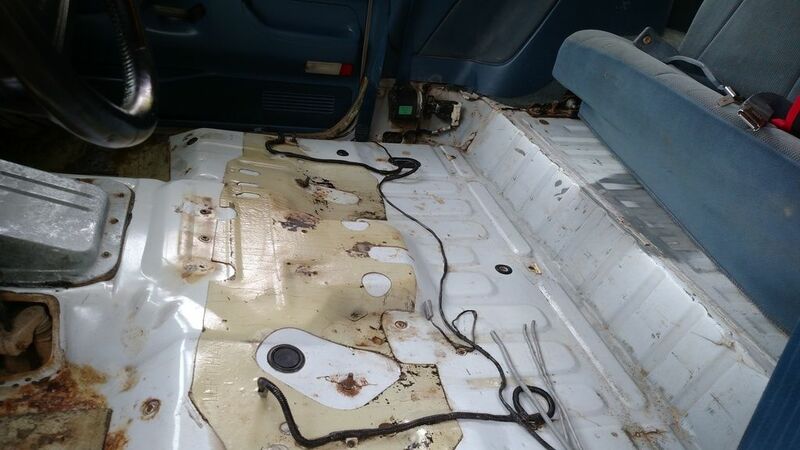 Also visible in the original carpet are the marks where the factory console was moved back about 5 inches and secured with new holes, so that the metal police console would fit. 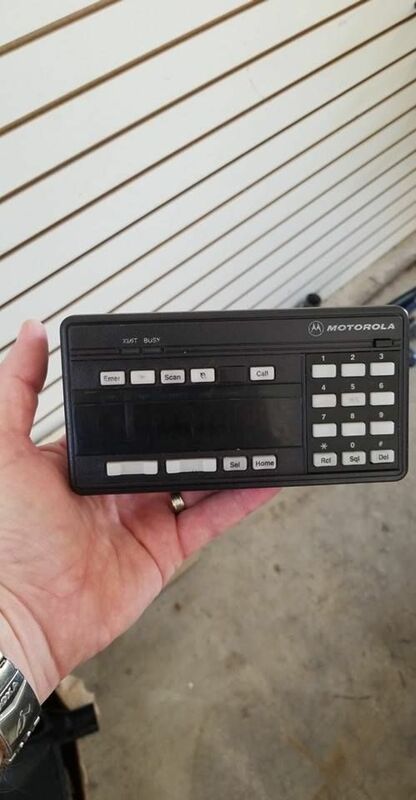 So I searched the internet for the right console, and eventually (with the help of some friends) was able to identify the correct console and locate one for sale. 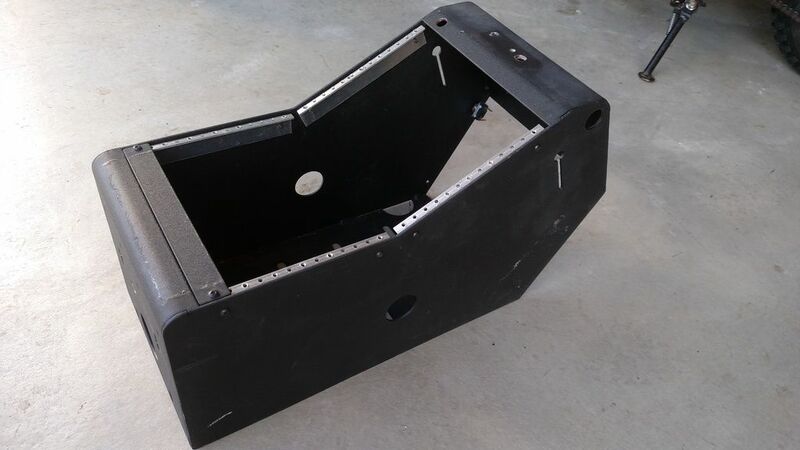 … and a dual shotgun/rifle rack that mounts between the front seats, against the cage screen. 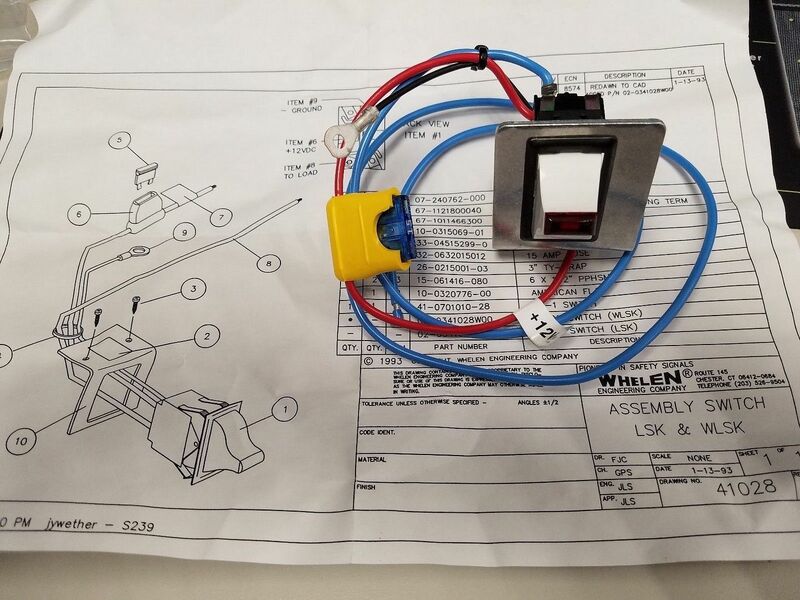 I also have a small push-button delay lock release for the gun rack that is the correct one used. I've been rather slow about getting this all together (I had hoped to have it installed be now), but it WILL be done by Spring. I'm not at all an electrical guru, so I'm relying on the help of an experienced pro who has been installing emergency equipment for 30 years. I kinda have to work on his timetable for this part of the project, not mine. One of the really neat things that I have is records from my Bronco's days of service. Some of those come in the form of photos, while others are numbers. 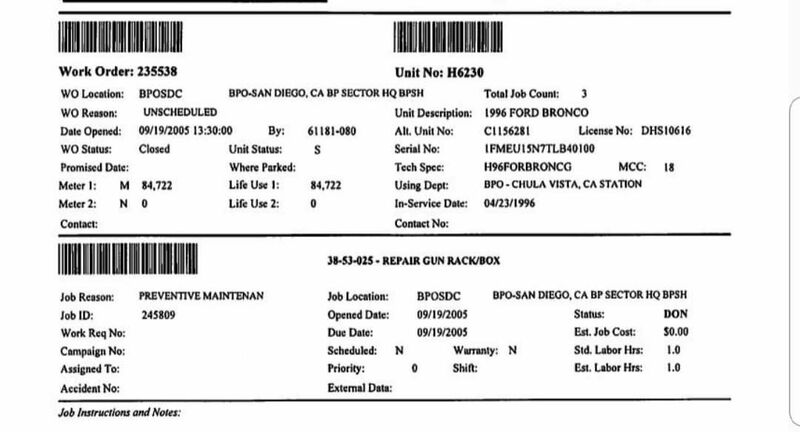 A friend of mine still works for the BP in San Diego & was able to track down some of the later fleet service records for H6230. In the 2000s, the BP went to electronic records, and all the older paper files were tossed. While I never expected those to still exist, I did get lucky. I was able to get a copy of the electronic records just before they were deleted from the system. I guess there was no need to keep records for a vehicle that was sold many years ago. The interesting thing (to me) on this work order to repair a broken shotgun rack, is the service date of 9/19/2005. This was the last record in the system for H6230. 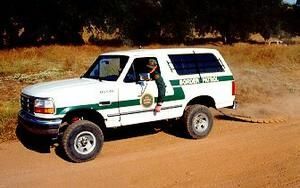 I know the Bronco was ordered by GSA and built-to-order in February, 1996. 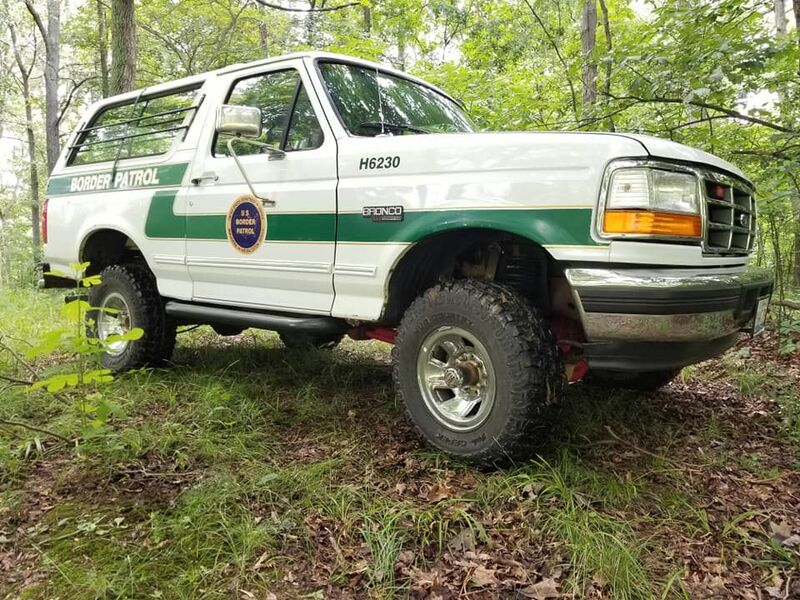 So that means it remained in service for more-or-less 10 years, which is an incredibly long time for any police vehicle, especially one that was off-road daily. Of course, it also went thru the government re-build process sometime in 2001, which was 5 years after it was put into service & gave them another 5 years of life. I think they got their money's worth out of it. 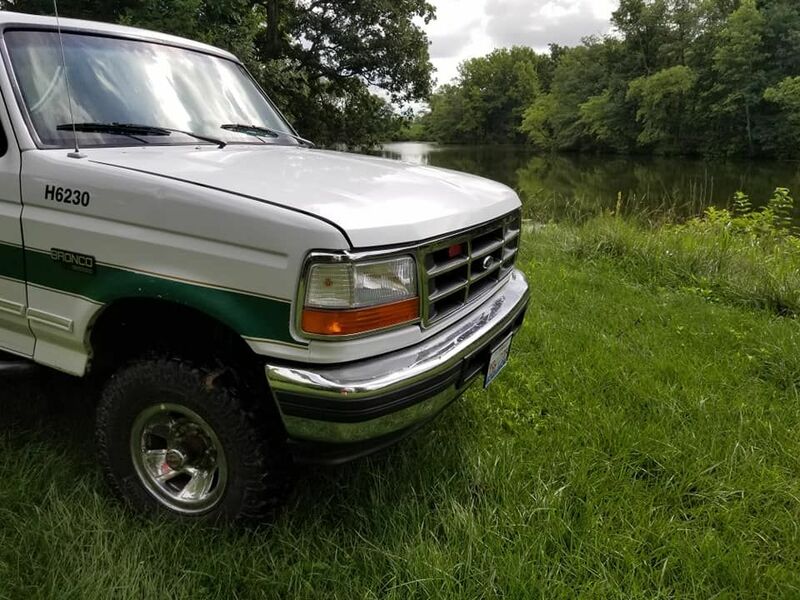 So with this knowledge, I reached out to a guy who makes high-quality reproduction license plates, and have an exact set of antique "J plates" on their way, with the exact number that THIS truck had in the field. In fact, I expect them to arrive next week. How cool is that? 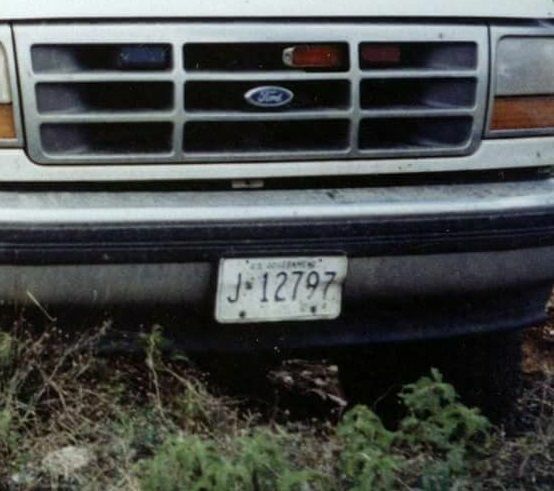 I'll explain in the next post a little more about the entire license plate issue. Hey, you guys tell me if this is getting boring, because I can go on & on! Here is a video of the day in Sedona. 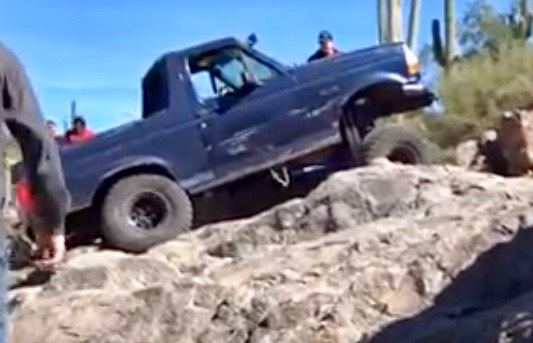 I go up the jeep slide on the harder part, not the slick ramp but the big bump next to it. That said, the rock out here is so sticky, climbs like this aren't as impressive as they look in person. I wish my buddy could have kept his finger out of the camera but otherwise I'm pleased with the video. Most areas along the border have a “drag road”, sometimes more than one. 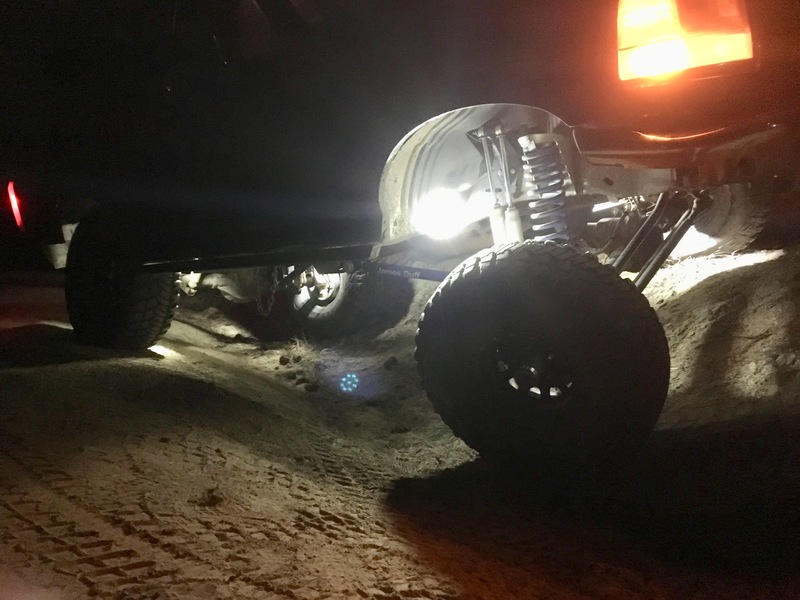 Agents loop a cable around their hitch and pull a string of old tires behind their vehicles to smooth the dust and make it easy to find fresh footprints. Usually, the agent who pulls the drag in an area is the only one to do so, and keeps track of when he makes each pass, which is important when you need to get an idea how fresh the “sign” (i.e., footprints) is when it’s discovered. Drag roads are low-tech methods that are extremely effective. Most people just ignore the roads and banzai north as quickly as they can, leaving a nice trail of sign to follow. However, there are always attempts to defeat the drag road and cross undetected. Using a broom, branch, something similar to brush out the footprints is extremely common and easily detected in the fine dust. People have tried to build awkward foot bridges across the drag road, leaving just a few marks behind. Quite a few will walk backwards across the road to make you think they are returning to Mexico. We’ve even heard of agents who have discovered people crossing with cow hoofs tied to the bottom of their shoes, which left a confusing set of tracks in the dirt, until you realized that the “cows” only had two feet. 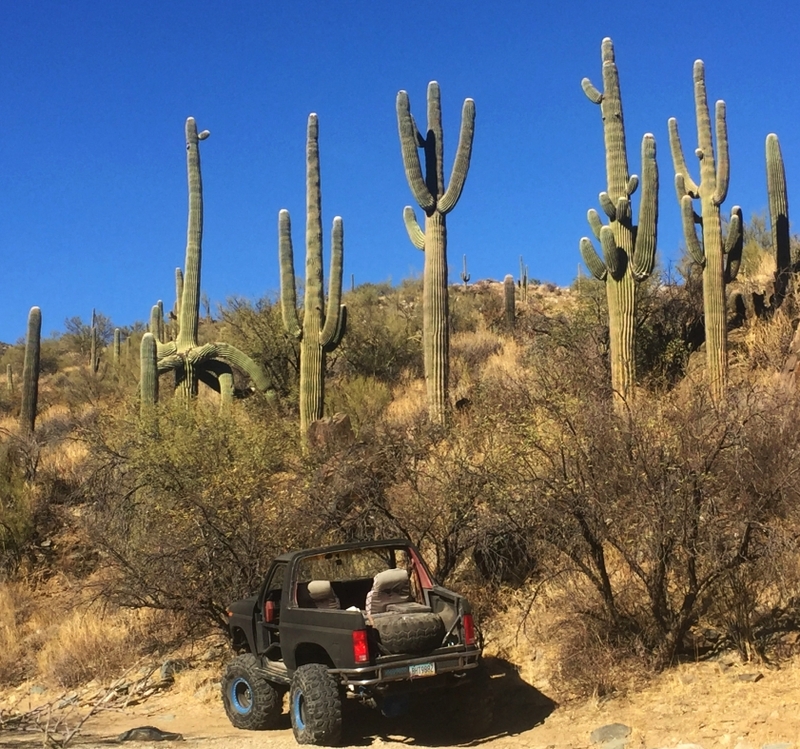 My own encounter with someone trying to sneak across a drag road without leaving any footprints was just outside Douglas, Arizona, where there are miles of desert and a very long walk ahead of anyone crossing. I had cut the road earlier in the evening, and on a return trip a few hours later, noticed an odd series of depressions in the dust. They were obviously footprints, but not shaped like a foot and didn’t leave a shoe-like tread pattern. I radioed the discovery to other units, who began crisscrossing the area, especially other dirt roads further north. Using this “leap-frog” technique, it was easy to catch up to someone on foot & end up with agents both ahead & behind them. Well, it didn’t take long for us to pick up their sign and track them less than a mile north. When the illegal crossers were finally found, we discovered why their footprints looked so odd; they had tied pieces of carpet to their shoes (kinda like a snowshoe), which actually worked fairly well, but slowed them down considerably. It was one attempt that wasn’t successful, but which we saw repeated a few times over the years, which probably means that it eventually worked for someone. If there hadn’t been a very smooth drag road next to the border fence, it would have been much more difficult to detect the crossing. 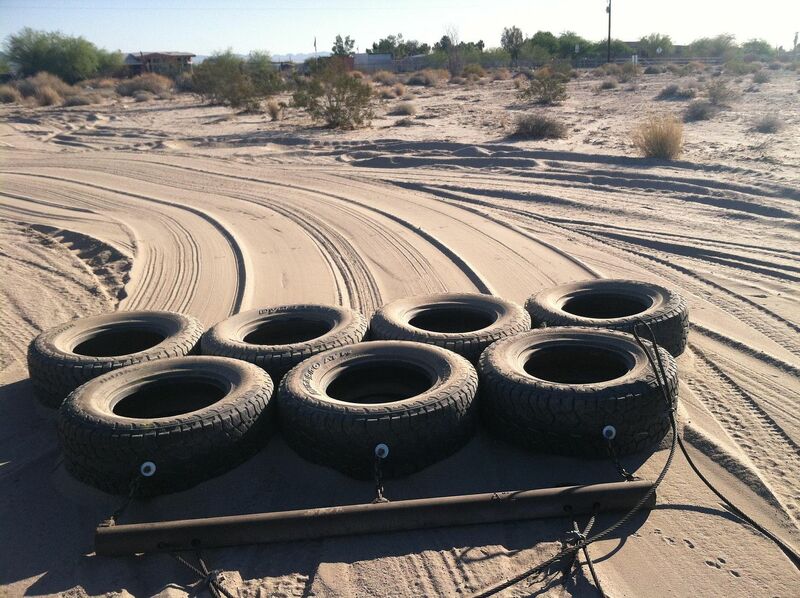 Although tire drags were & are very common along the border, that’s one accessory that I’m not going to duplicate for my restoration. 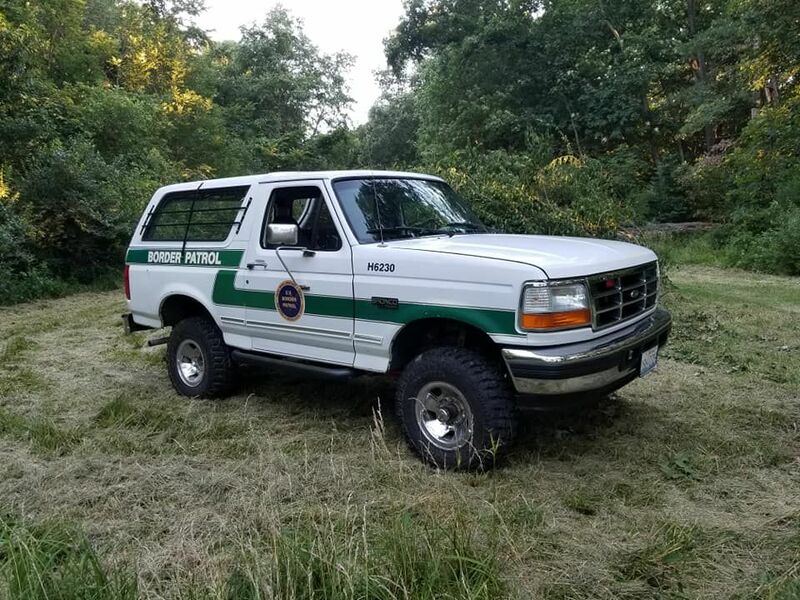 “Is it legal to drive that thing with all the lights and markings?” That’s a question that inevitably pops up when people see my Bronco, either in photos or in person. No, it’s not. There’s a specific state law (625 ILCS 5/12-609) (from Ch. 95 1/2, par. 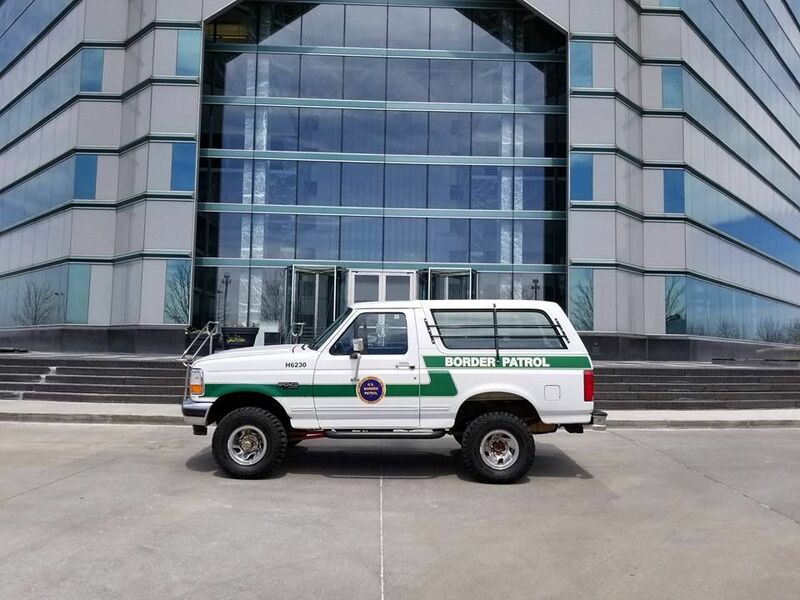 12-609) which says you can’t drive a privately-owned vehicle marked as a law enforcement vehicle on Illinois public roads. Obviously, you’d expect that to be illegal. However, there’s an obscure section of the law which allows antique police vehicles to be fully marked and equipped with emergency lights. As you’d expect, the use of emergency lights on public roads remains tightly restricted. So basically, you can have them but not use them on your street-driven antique police vehicle. If you’re in a parade or official event, the police will generally have no problem with the lights & sirens being on as part of the celebration or demonstration. Cool huh? So what’s an antique vehicle? 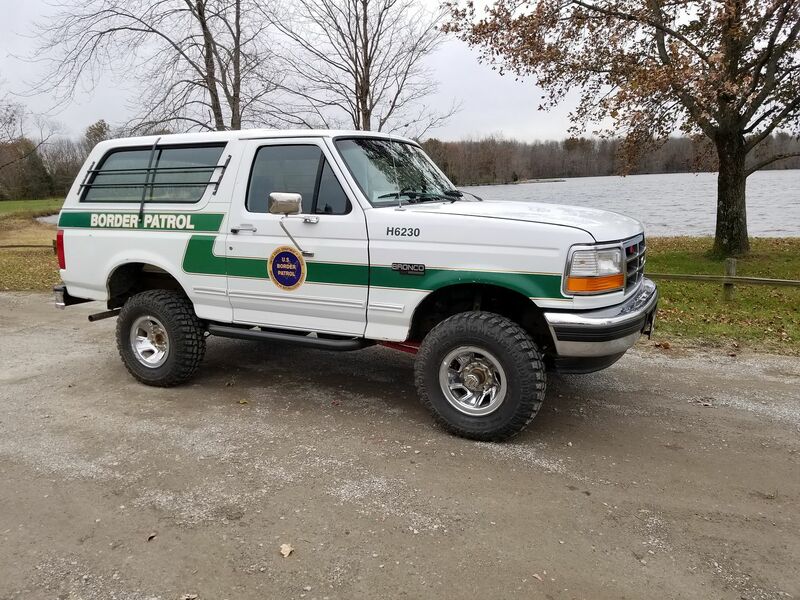 In most states, any vehicle 25 years or older is eligible to be registered as an antique, which is MUCH cheaper and excludes you from many emission requirements. But it may also limit their use. 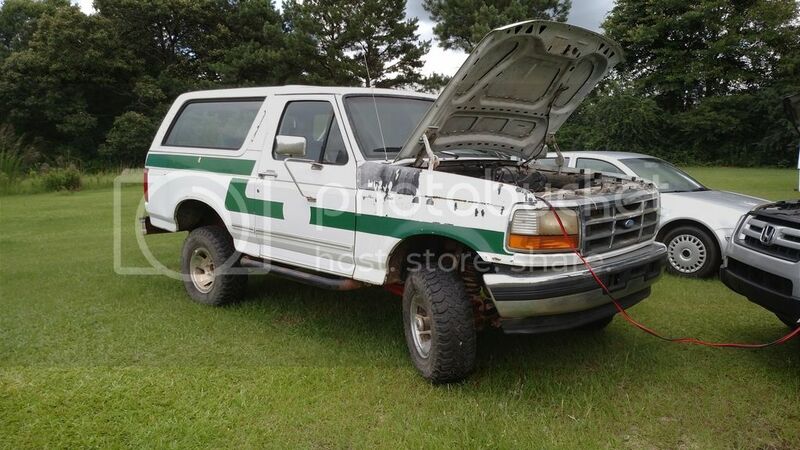 Basically, an antique vehicle can’t be your daily driver; it’s for limited use such as shows or events. 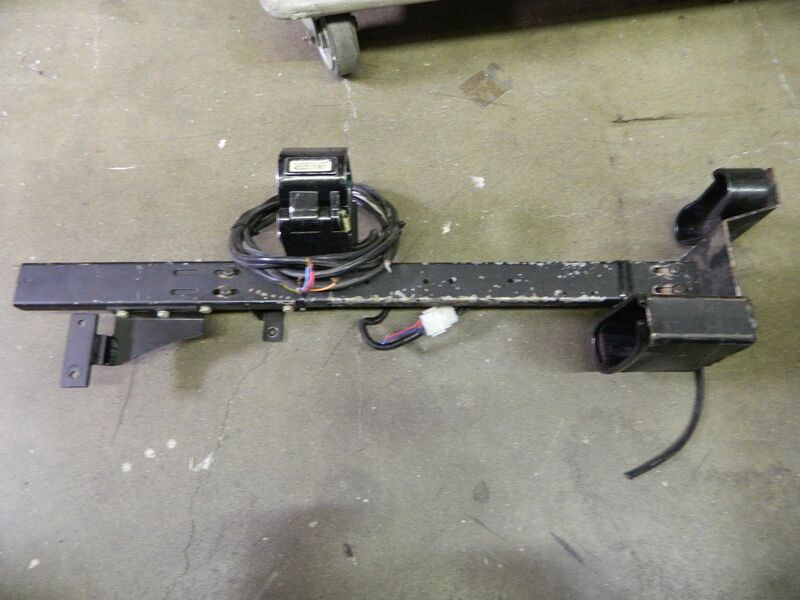 If you have a 1966 Mustang, you can find original 1966 license plates and display them on your car instead of a current antique plate, if you carry the valid antique plates in the car. I’ve done a lot of research on this, and there’s no requirement that it must be an original Illinois plate; it could be from anywhere, as long as it’s the same year (in this case, 1966). If I could only find a set of vintage government license plates to display on the car, once it’s officially an antique. Hmmm… maybe I know of a set of restored ones, sitting on a shelf somewhere, waiting patiently. Actually, I mentioned before that I should have a set in my hands in a matter of days. 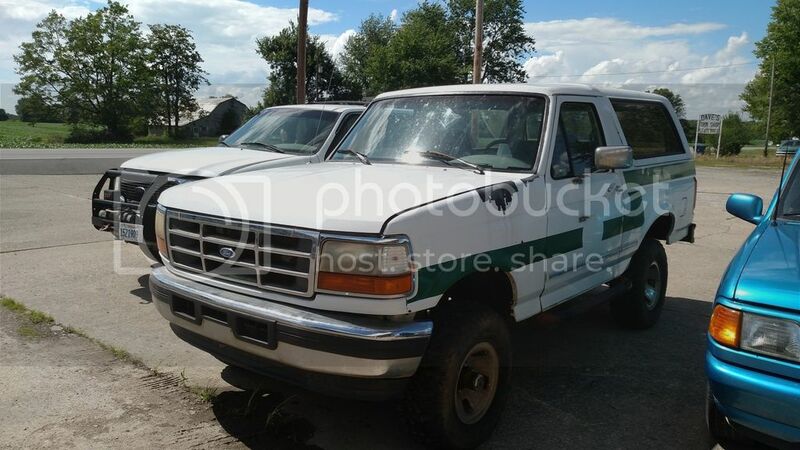 So now you know why I don’t drive the Bronco much on the road. In 25 months, that will change, but I’ll still be careful of where and when I drive it. As you can imagine, there’s not a lot of love out there right now for border and immigration enforcement. 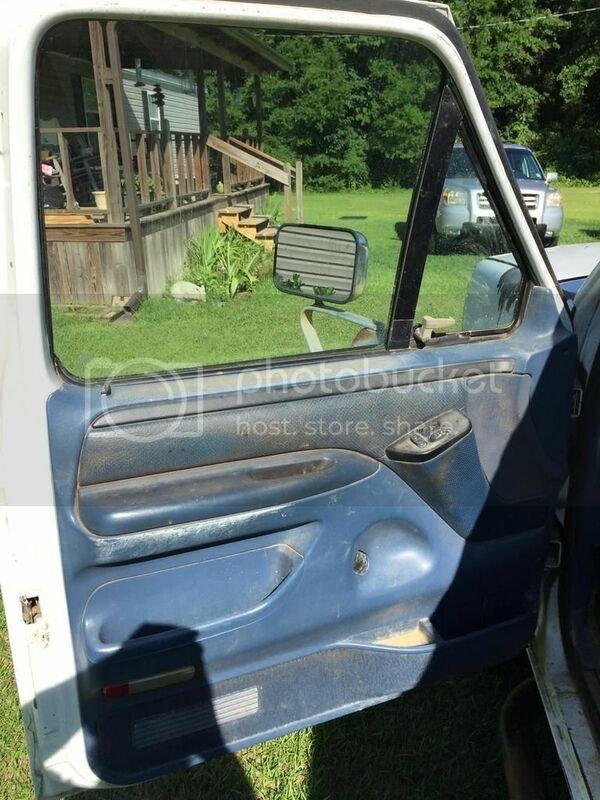 Even though I could be technically ok driving it somewhere, that wouldn’t mean much if I ended up with a busted window or a key scratch running down the side. 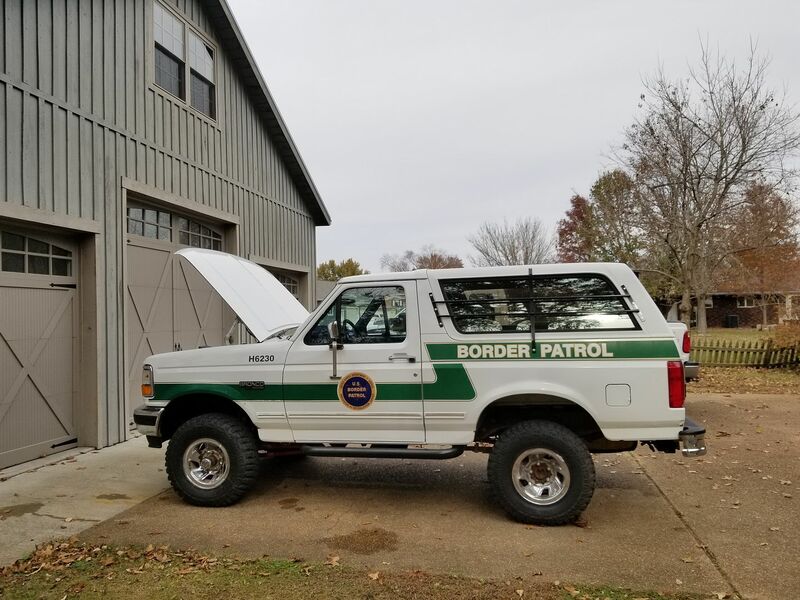 I really hope people understand why I hold the USBP in such high regard, and why I’d want to restore a vehicle back to its in-service condition. It has nothing to do with looking cool or making a political statement, but with preserving a bit of history and honoring the outstanding people I was fortunate enough to work with for many years, including my academy classmate, friend and vehicle partner, who was killed in 2002 while on a temporary work detail in Arizona. Great run thus far! I. Waiting till the end before I cast my vote. It is t going to be easy either, so keep the stories and pics coming! Occasionally large groups of people (50-100+) would run north through the port-of-entry and we'd have to scramble to apprehend as many as possible. 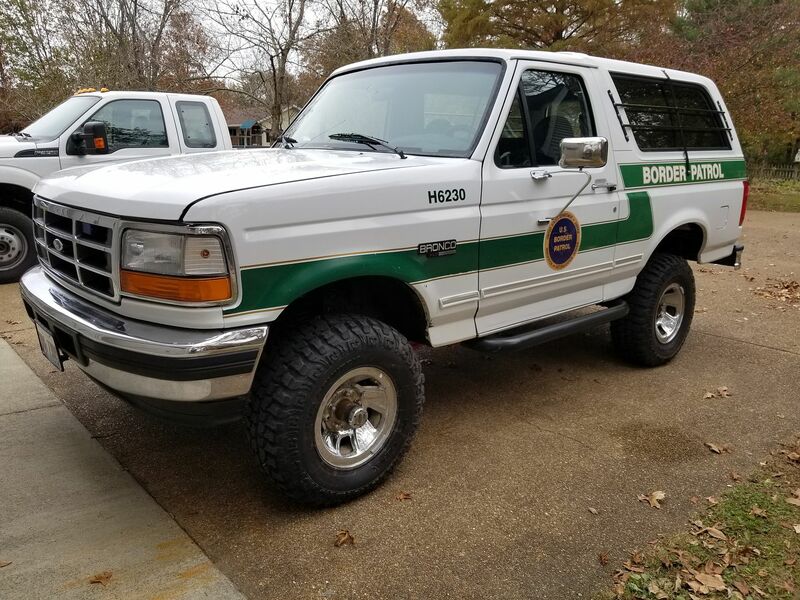 We'd be zipping around the area in the Broncos, grabbing as many as possible, and holding them until a van could pick them up from us. This chaotic scene would be repeated every few days, and although most would be caught, quite a few would slip past us. 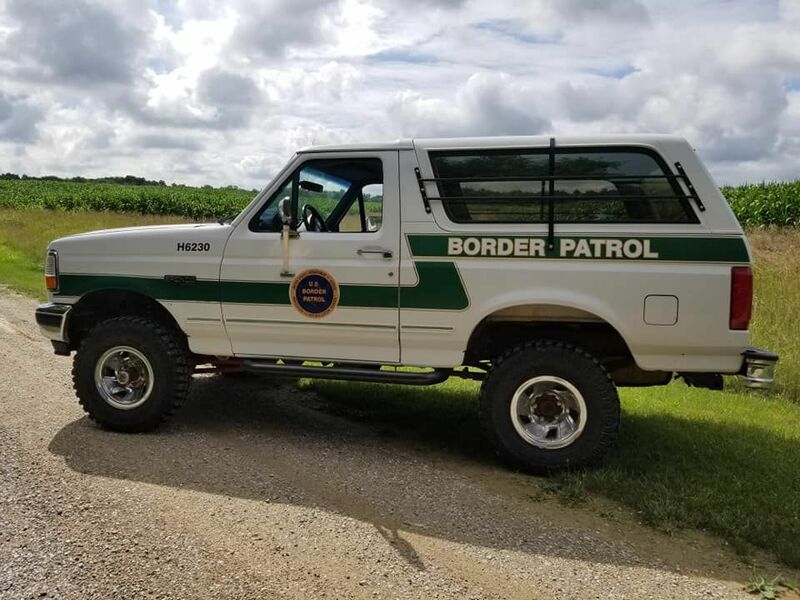 I believe it was sometime around 1999 when we were just finishing up after one of these "bonsai runs" when an agent called out for non-urgent assistance in a parking lot just to the west of the port-of-entry. 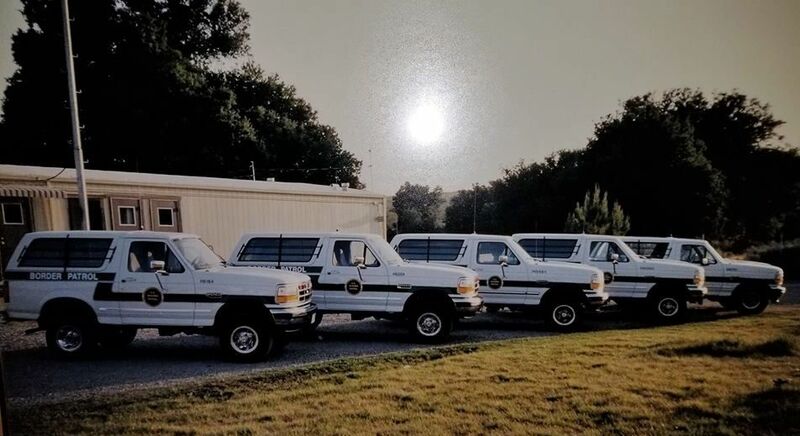 By the time I was able to transfer the people in custody from my Bronco to a transport van, most of the exciting stuff had already happened in the parking lot. I got there late, but that ended up being fortunate. Long story short, the agent was looking for some of the port-runners when he smelled the very strong odor of marijuana coming from a U-haul rental truck that was backed up in a spot at the rear of the parking lot. They called a K9, which verified, and ultimately opened the back to find more than 3,200lbs of marijuana stacked inside. No one was around, so there were no arrests with the seizure. Anyway, it was all packed up & carted off, and by the time I got there, just my supervisor & I were left in the area. We leaned against the fender of H6230, chatting about the load and wondering how the heck they got that many bundles across unnoticed. We were literally within sight of the busiest land border port-of-entry in the world. You couldn't simply walk them across, and throwing bundles would have quickly been noticed. The possibility that there could be a tunnel crossed our minds, and we started walking around the area, stomping on the ground and tapping the asphalt with a big piece of rebar. I was tapping near the concrete curb a few yards from where the U-haul had been parked when I heard a hollow sound. Calling my supervisor over, I continued to tap to show him. Three taps and the rebar unexpectedly broke through the asphalt, sinking out of sight. We looked at each other in surprise, then laughed and started pulling up chunks of the parking lot, revealing a tunnel that eventually was determined to lead from a building on the Tijuana side to the storm drain next to the parking lot. We deduced that the smugglers would crawl thru the tunnel for about 300 yards from Mexico with the bundles and pass them through a square hole they had cut in the back of the storm drain. Another person would drop into a manhole cover on the U.S side, receiving the bundles and handing them to another person laying under the truck, who would pass them up through a hole cut in the bottom of the U-haul truck. They had even caulked the removeable concrete block in the storm drain so excessive water wouldn't flood their tunnel. 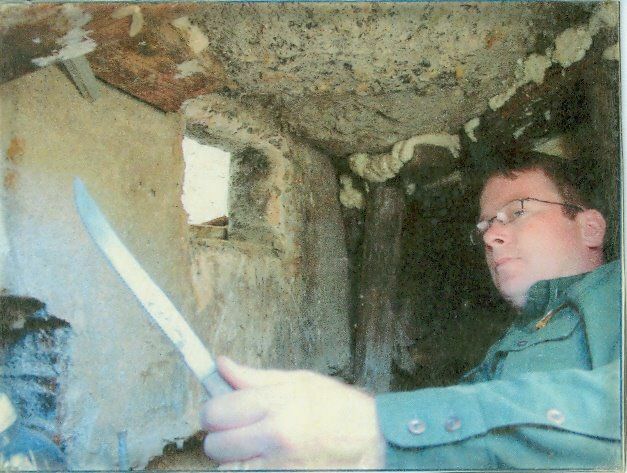 Here's me with a knife I found in the tunnel. Our best guess was that it was used to cut through the calk when they removed the block to pass the bundles through. I'm sitting on the side of the tunnel that leads to Mexico, and you can see the concrete curb above my head and the opening where the bundles were passed. This was not a simple tunnel. Although it was barely big enough to crawl through, the smugglers had added bracing, carpet and had electric lights strung all along it. That was fairly unusual and suggests that the tunnel had been in use for a while, and a lot of money & effort went into its construction. Of course, I had to cut off a section of the lights as a trophy from my first tunnel. 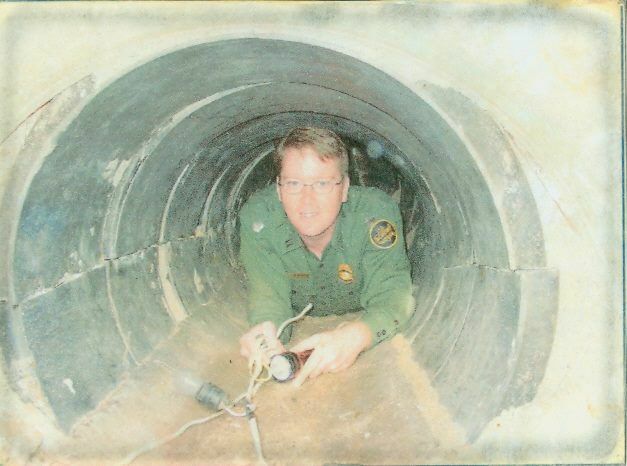 In the years that I was in San Diego, three tunnels were discovered. The last one was large enough to have a rail car running through it, and came up into a freight warehouse. Although I saw it, I was wasn't a part of that discovery. I think it was my day off or something. I was washing the Bronco last week & decided that I needed to get the undercarriage and engine compartment a little cleaner. The plan for the day was to fix whatever was wrong with my turn signals (which didn't flash) and prep for the Saginaw swap. Well, long story short, I got a little over-zealous with the power washer & got water inside there somewhere it shouldn't be. 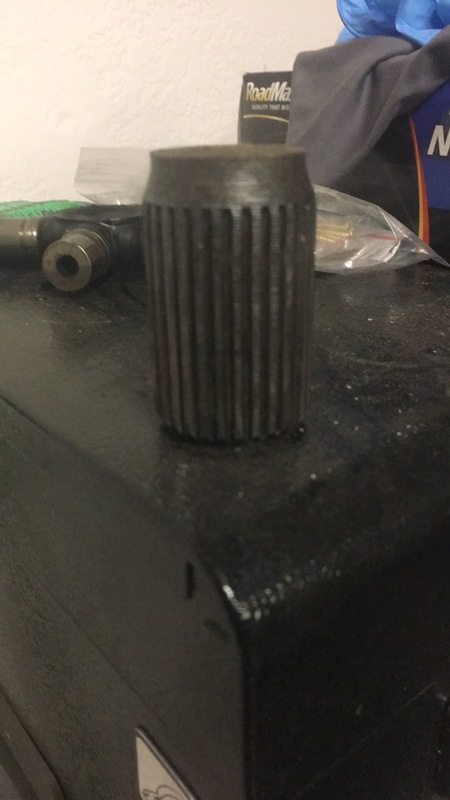 It wouldn't start. I sat there at the car wash for an hour, hoping it would dry out enough to start. It was SO close to firing! Eventually I called a family member to come give me a jump, because at that point the battery was getting weak. A little shot of starting fluid was tried, and once again, we were SO close to getting it going. So we tried a big squirt and BAM! It backfired and blew the lid of the factory airbox apart. WTF?! I mean seriously, have you ever seen a backfire do that? I can see how it would happen though; the fumes must have filled the snorkel and airbox before they got back into the intake, and then it all caught at once. That starting fluid is wicked stuff! I have never seen such a thing! Completely broke the lid, throwing the pieces all around the engine compartment! Anyway, we eventually got it started and I drove it home and parked it inside to dry out more. That's the last time I get busy in there with a power washer! Honestly, I thought I was doing pretty good keeping water away from sensitive parts, but I guess not. 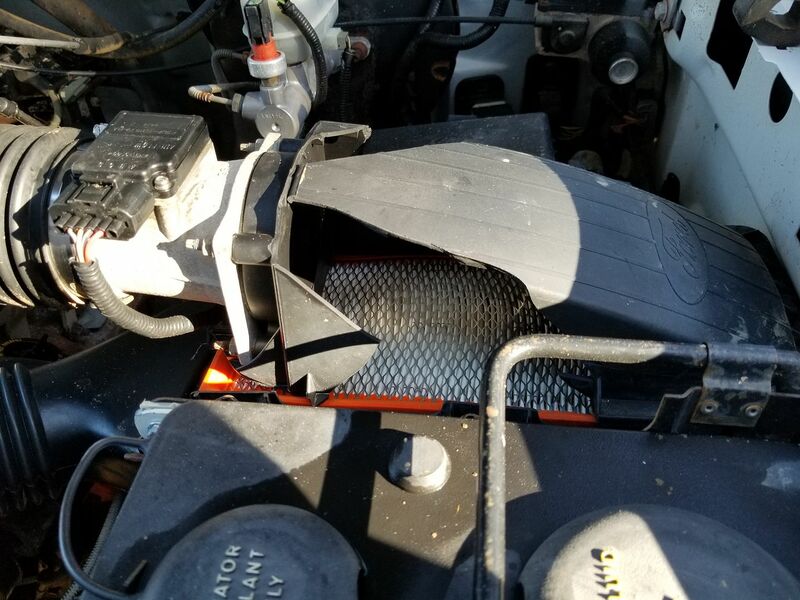 So now I'm looking for a replacement plastic airbox lid. If anyone has a spare in the garage that their willing to get rid of, let me know & I'll send you some pizza money. But the happy ending of the story is that I DID get my flashers working, which haven't worked right since I got the truck. Two steps forward & one step back. Nothing is ever easy, is it? Just tallied my vote! Good luck gents!